You’ve probably encountered the artwork of Pamela Colman Smith before, even if you didn’t realize. Colman Smith drew the images for the most well-known tarot deck, and these popular images are still commonly reprinted and used on tarot decks today. “The Green Sheaf” from The Green Sheaf by Pamela Colman Smith (ed. ), John J. Burns Library, Boston College. Colman Smith produced more than a tarot deck, however. Going by the nickname Pixie, she was an active part of Irish poet William Butler Yeats’ literary circle. She and Irish artist Jack B. Yeats co-published the literary magazine The Broad Sheet. Colman Smith eventually decided she wanted her own journal, however, and began The Green Sheaf, which Burns Library has in its holdings. Green Sheaf No. 1 title page from The Green Sheaf by Pamela Colman Smith (ed. ), John J. Burns Library, Boston College. 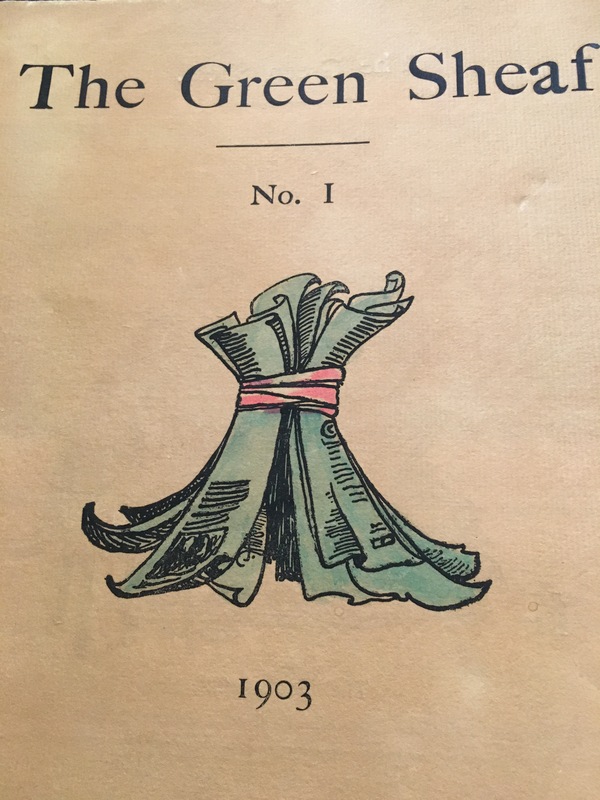 The Green Sheaf had 13 total issues, each printed on handmade paper (later advertised as “antique paper”) and featuring hand-colored illustrations by Colman Smith and other artists. The publication is sprinkled with the works of well-known authors; AE (George William Russell), Lady Gregory, and William Blake number among the contributors. W.B. Yeats himself contributed a short story—“Dream of the World’s End”—to the second issue. Jack B. Yeats contributed an illustration to the 10th issue, and Blake’s books were advertised on the back of the magazine. Colman Smith had a number of interests and business endeavors outside The Green Sheaf, and traces of these can also be found throughout the serial. A posting from a “Miss Baillie” for point-lace making lessons advertised lace designs by Colman Smith. The Green Sheaf includes advertisements for Colman Smith’s stage act. Under the pseudonym Gelukiezanger, Colman Smith would dress up and tell “West Indian Folk Stories” at private parties. She later published these stories as Annancy Stories (1899). Colman Smith also expanded from publishing to bookselling. While the first two issues of The Green Sheaf are advertised as only sold by Elkin Matthews, Colman Smith adds herself as a second seller to the magazine beginning in the fourth issue. Green Sheaf advertisement from The Green Sheaf by Pamela Colman Smith (ed. ), John J. Burns Library, Boston College. work still stemmed from her illustrations. Colman Smith sold prints of her original artwork, which she advertised in her magazine. One notable illustration was a portrait of W.B. Yeats, which readers of The Green Sheaf could purchase as a print or as a signed, limited edition proof on India paper. 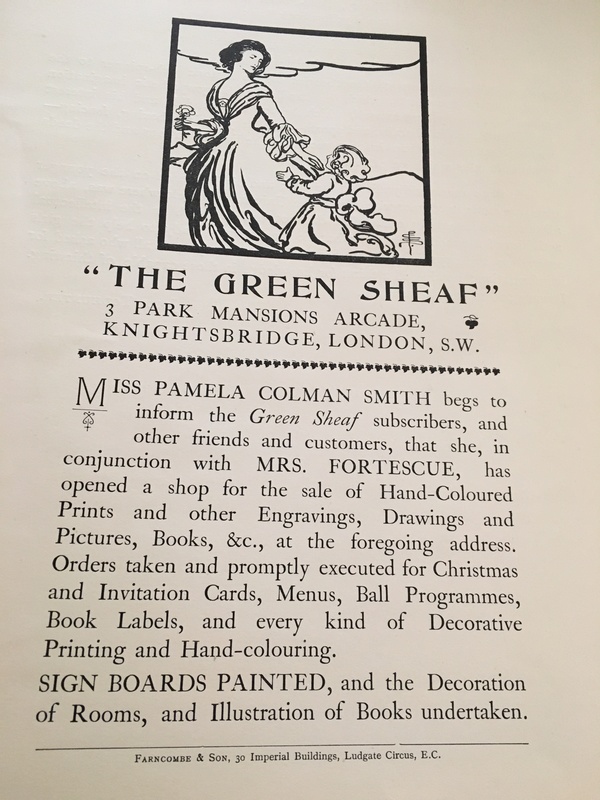 In addition to advertising hand-colored prints, Colman Smith offered custom orders for books, programs and advertising cards as part of the “Green Sheaf School of Hand Coloring”. The seventh issue includes an advertisement for “BOOKPLATES and PRIVATE CHRISTMAS CARDS Designed, Printed, and Hand-coloured to order” as well as a hand-colored print of “‘Cathleen Ni Hoolihan’ an illustration of the play by W.B. Yeats” By the 12th issue, published in 1904, the Green Sheaf School of Hand-Colouring had opened a shop in Knightsbridge, London. The Green Sheaf is certainly a publication of interest for the beautifully printed poetry and artwork; it is also a fascinating document of its editor and printer. Through The Green Sheaf, readers can find the traces of Pamela Colman Smith’s friends and partnerships with other literary and artistic figures of the day, as well as the sheer number and variety of her artistic and business endeavors. Colman Smith, Pamela. The Green Sheaf. London: Elkin Matthews; New York: Brentanos, 1903. Foley O’Connor, Elizabeth. “‘We Disgruntled Devils Don’t Please Anybody’:Pamela Colman Smith, The Green Sheaf, and Female Literary Networks.” South Carolina Review 48, no. 2 (2016): 72-89. 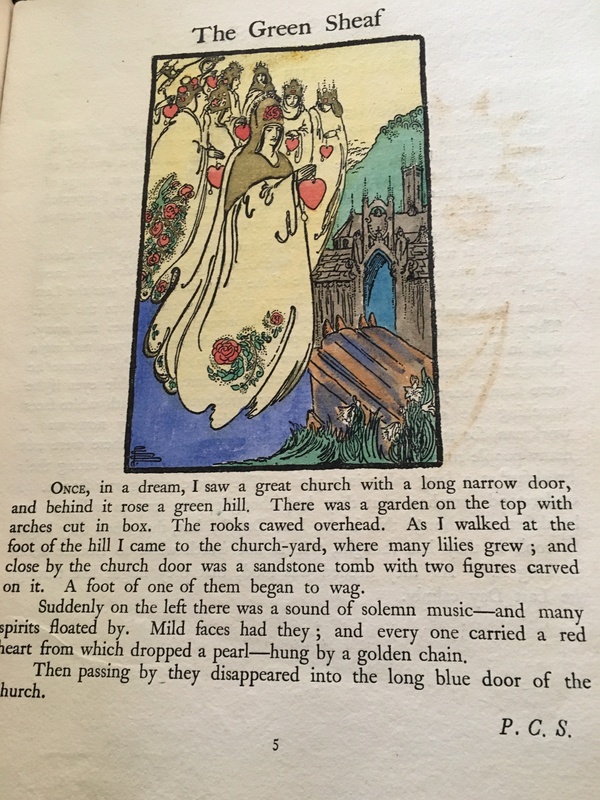 This entry was posted in Fine Press, Rare books, Staff Posts and tagged arts and crafts movement, Green Sheaf, illustration, irish literature, Pamela Colman Smith, print-making. Bookmark the permalink.